A small donation or a purchase from the online store, (See below.) will help helps towards the upkeep of my blog and registry. No donation is too small. 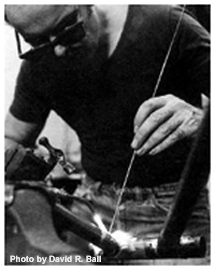 Above: All frames built by Dave Moulton are measured from the Center of the Bottom Bracket to the top of the seat lug, or to be precise, to an imaginary line just above the seat lug. This is the traditional way of measuring by most English framebuilders. 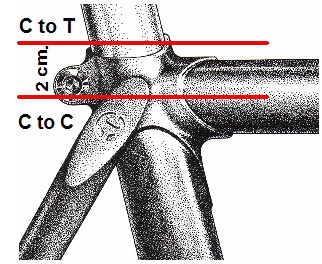 Most Italian framebuilders measure to the center of the top tube. 54 cm. stamped on a Dave Moulton built frame, will measure 52 cm. C to C.
It becomes a problem when someone sells a frame and lists it measured C to C and the buyer assumes it is C to T, or vice-versa. The reason behind this registry is to account for, and thereby preserve frames that I built, for the current owners and future owners. Of the many frames I built, for example around 2,500 with the Fuso name, I can probably only vouch for a few hundred of that brand. Where are the rest? Unfortunately many are lost through accidents and neglect; others thrown out by people not realizing they had a hand built product, and some have ended up in land fills. Many more I'm sure are sitting in garages and basements just waiting to be discovered again. Hopefully people finding these frames in the future will do a little research and maybe find these pages and realize there are people who would love to own and ride one of these bikes. I retired from framebuilding in 1993 so there will be no more built, therefore it is important to preserve the frames I did build. There is rarely a week goes by without one of my frames coming up for sale on e-Bay or Craig's List somewhere. Often a new owner will e_mail me, but more often than not I never hear of that frame or bike again. Maybe people think I am too busy or they don't want to trouble me. Now I hope people will at least e-mail me and register their frame here. I would like to list a frame number, the size, owners name, city and state. However, if anyone wants to just register the frame number but remain anonymous, I will respect their privacy. I hope in time this register will help in preventing fraudulent sales, and the selling of stolen bikes. I also hope the people listed this site will eventually become an online community of "dave moulton" owners. 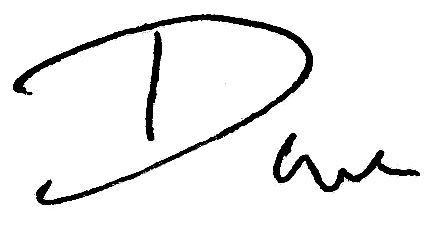 If you own a UK or US built dave moulton custom, or a John Howard, Fuso or a Recherché bike or frame, please email me (E_mail link is at the top right.) with the serial number, (Stamped under the bottom bracket.) and frame size. Your name, city and state would be appreciated, along with such info as "When did you acquire the frame, are you the original owner?" Does the frame have original paint, or a repaint, etc. As much info as you care to give me. Your email will never be shared with any third party. If any member requests to be put in touch with you, I will forward the e_mail and let you decide whether to respond. There is now a Gallery page with pictures of owners bikes, these are listed by frame numbers. As you hover over a thumbnal picture the frame number is revealed. Some owners also have pictures on Flickr, PhotoBucket or somewhere else on the web, these are linked to the actual frame numbers in the listing, and appear underlined and a different color. I built many bicycle frames over the years, but the frame serial number makes each one unique. 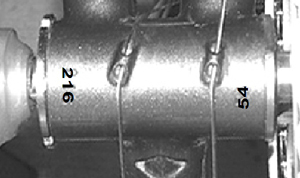 Above: The frame serial number stamped under the Bottom Bracket shell is usually a 3 or 4 digit number. The frame size is a 2 digit number. This is obvious in most cases, but becomes confusing when numbers contain 9, 6, or 0. for example frame number 069 might be read upside down as 690.